OMG the weekend is finally here! Does anyone ever feel like that?! but made so many leaps and bounds! So I need your opinion. Do you like the vest? I made it and I wasn't sure how I felt about it. but just having a creative worry I guess. but I'm afraid to shorten it. The bag I designed but linked a similar one and the heels are old zara but I linked a cute sparkly pair as well! I am so in love with your coat! You've styled it wonderfully! Great post! Ahhh I know Chicago is being super nice this fall :) Hope you get that sweater weather! Love that camel vest! Perfect for fall! This vest is perfect!! You look amazing as always!! Fab styling, Jessica! 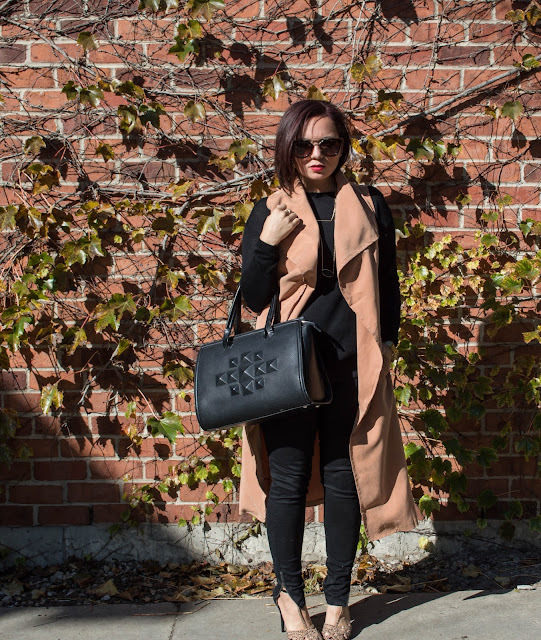 Love you camel coat vest with all black!! 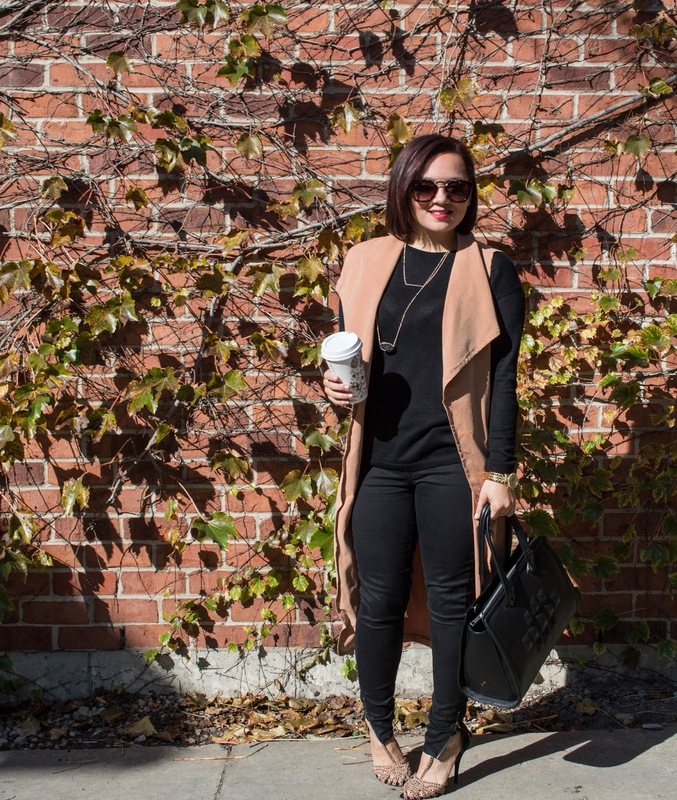 great fall look. and yes, last week seemed awfully slow for me as well. haha. if only the weekends were just as long! What a great vest, I am loving that you paired it with neutrals. That vest if fabulous! I love how you pair it with an all-black canvas!!! Thanks Tif! I'm all about the black! I absolutely love everything about this outfit. You look great! I love the vest! I thought it was from a high end store but you made it yourself!? Woah it looks amazing and you're very talented. Sucha a perfect look! I like everything about your outfit!! I love the vest! I think I like that you left it long, it adds an interesting element to the outfit. Great post! Thanks Kiki! I was just worried it would overwhelm me! Your vest is FAB!!!!!!!! I need one!! It seems like long trench vests are really trending right now. I'd prefer to wear a shorter vest, but that's just me. I hear ya girl! I wasn't sure pattern said long I should have met it in the middle! I love that vest even more now that I know you made it yourself. Are you going to be selling it on something like Etsy as I would buy it? Beth I don't have an etsy shop but if you were serious I would totally make you one :) Just email me. You look great. Love the vest. Thank you so much :) It is a favorite of mine! I can't believe you made that!! So cool! Such a chic look, and I love the length! Ive been seeing so many long vests around. Chelsea thanks yea I'm really proud of the way it turned out too! I'm new to your blog & I can already tell I will be a dedicated reader. You have such great taste & I love your style. I would totally wear something like this to work but instead of black jeans I would wear black slacks. Your blog is awesome! Such a classy outfit! Love the camel vest, you look gorgeous! Thank you so much! I loved your last post very informative! Wow I love this vest so much! I have a similar one that I wear all the time :) You look super pretty! Great outfit! Loving that vest! May I could def make you one :) Email me! YOU MADE THAT?!?!?! Color me impressed. Color me camel. I love it, why are you doubting yourself?! Thanks Kelly! IdK just being so short I felt like it overwhelmed me a little! wow I am impressed love the rest long! GIRLFRIEND...you are rocking this look and that vest is soooo amazing! I know right! I was nervous and now I'm like yep this is okay!! you made the vest? wow!! That's amazing & you look fabulous! I really like the vest as is. Great outfit! You look gorgeous, I love your vest! Beautiful outfit! I love the long vest; so pretty! I love it long like that! Happy Friday! Such a lovely outfit. You look awesome. Happy weekend. Love that bag, amazing outfit! Gorgeous ensemble! I love the color scheme and the long vest. That's awesome you made this, I can't imagine doing that! I like it long personally, I think you should keep it as is! Great outfit! Loving that vest on you! You made that vest?! I can't believe it! It looks so good! I'd totally buy it! You look amazing! I absolutely LOVE this look! 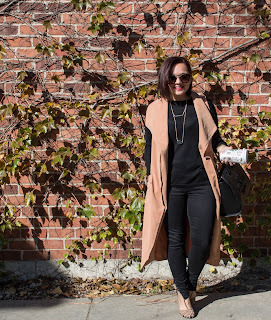 Camel and black is such a great pairing - that coat is amazing! 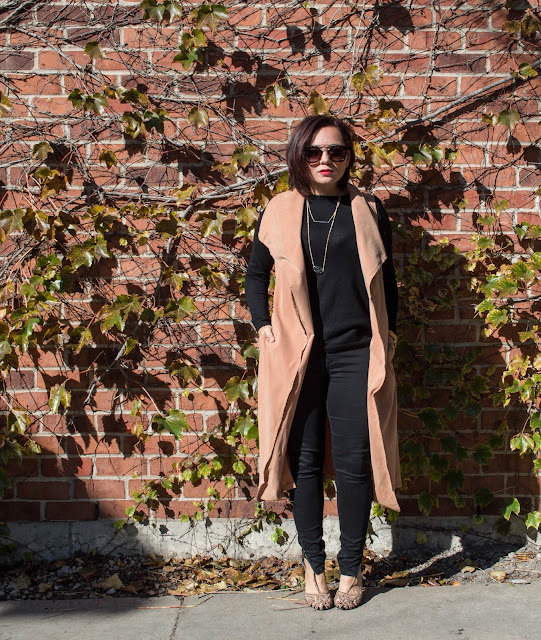 The camel vest looks amazing on you and love the pairing with black everything here! You rock girl! Killer vest! 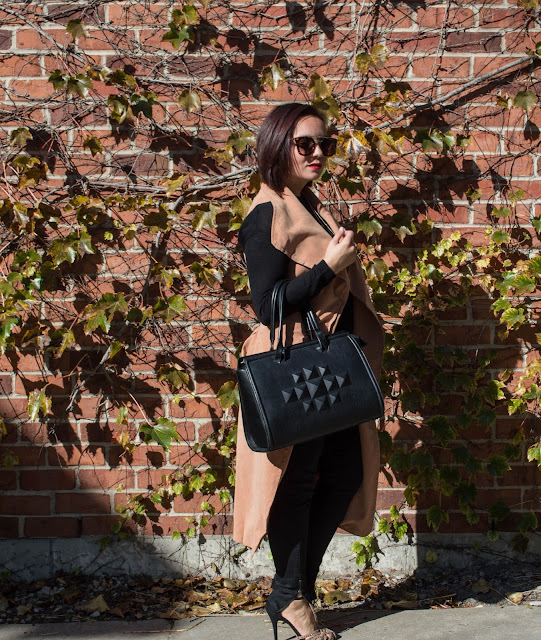 You look absolutely chic in this outfit! Cute vest!! You styled it perfectly! LOVING the long vest, lady. Too chic! Jessica! You look so fabulous in these photos. So glad we connected on instagram as I get to see all of your awesome outfits! That's so awesome you made that vest yourself! So talented! I like short vests for my body type, but you're pulling this length off! I can't believe you made that vest, it looks so perfect for fall!! The longline vests are so in, keep it this way! U look fab! Can't believe you made it! Looks fabulous and fits well. Love the embellished bag too. love the camel vest, and the shoes look so nice too! you look amazing! the camel coat is so good!